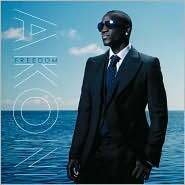 I've been mentally searching my record collection for precedence of liking an artist like Akon. I generally steer clear of R&B and I'm certainly not a huge supporter of 35-year-olds freakdancing underage girls (or Tara Reid) onstage. But there's something about Akon. I've tried to ignore the temptations, but I just can't help loving this record. It's easy to get sucked in by a catchy single. "Freedom," however, cranks out hit after hit. The album starts off with the excellent "Right Now (Na Na Na)," before launching directly into the mid-tempo "Beautiful," featuring the silky vocals of Colby O'Donis and Kardinal Offishall. Oh, but it doesn't stop there. "Keep You Much Longer" is yet another dance floor anthem. By this point in the album, I want nothing more than to make lots of money and find eternal love in the back of a club. "Freedom" has all the obligatory guest appearances--T-Pain, Young Jeezy, Wyclef Jean--but Akon proves he's plenty capable of being the main attraction. He's becoming the king of laid-back cool, effortless laying down millions of great love songs. Makes me want to get my freak on. I will not be picking up this album, sorry. However, I did pick up The Streets, but have yet to iPod it yet. I am in the mood for something different and a Brittish, white rapper sounded like it would fit the bill. I'll let you know what I think. Come on, give Akon a shot. If you're going to start listening to the Streets, I'd recommend starting at the beginning with Original Pirate Material. Still not sold on Akon. However, I have listened to this Streets album twice now and it is great! If this is the worst of the bunch, I can't wait to hear the other albums - especially because I love Pirates. Have you listened to Republic Tigers yet? They are fantastic (in my opinion). Let me know if you want a couple tunes sent your way as a preview. I just got Republic Tigers from the library last night, so I'll let you know how it goes. I have everything is borrowed, but will be getting the other two shortly. Thanks for the suggestion.